Trails Near Milwood | Milwood Neighborhood Assoc. The City project to extend the Northern Walnut Creek Trail to Amherst is well underway. Construction was originally expected to last approximately 6 months, however recent rains have slowed progress so the completion is likely to extend into November. walls and drainage culverts have been installed. Concrete pours for trail surface will be starting very soon, weather permitting! 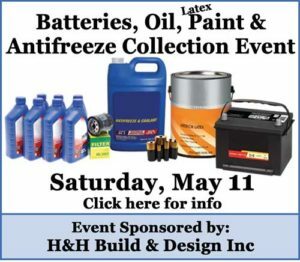 see Northern Walnut Creek Trail Page for more information. This work has closed several trails so we have put together a map to help navigate around the work area: 2018 NCWT DETOUR Please respect the “Trail/Sidewalk Closed” signs and “Restoration in Progress” signs. Also, please do not cut new trails – if not properly located new trails can cause soil erosion and damage vegetation. Some of the restoration in progress signs are a result of such trails. We will work with the City after construction is complete to reconnect existing trails where possible. ** see updated maps below for detours around construction areas Trails in/around Milwood! 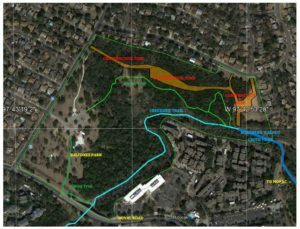 This map shows a route from Balcones Park towards Mopac and the Northern Walnut Creek Trail (blue trail). This route is paved although some areas are constructed with a rough surface. The route provides a detour around ongoing construction in the park. There are side trails and alternate routes including the green trail that can be used to make a loop back to the parking lot. Once you reach Walnut Creek park there a many more trails. See the Walnut Creek trail map for more details. This track shows several trails within Yett Creek Park and a trail to Riata Park which features a large pond with abundant turtles, fish and waterfowl. Unfortunately access to Yett Creek Park from Milwood has been complicated by the removal of the railroad crossing on Dorsett near Enchanted Forest but this area can be reached by taking Duval Road to West Cow Path or Parmer to Riata Vista Circle.